The global effervescent packaging market is prospering, projected for a healthy CAGR of 7.9% during the forecast period of 2017 to 2027, gaining traction from a number of factors such as growing popularity of fast dissolving drug delivery systems, expanding penetration of e-commerce in a number of emerging economies, and rising consumer interest in preventive healthcare. On the other hand, regulatory issues, lack of financial might of regional players, and low penetration in developing countries are a few restraints over the market. The global market for effervescent packaging is estimated to be worth US$711.4 mn by the end of 2027, notably up from its evaluated valuation of US$311.8 mn in 2016. The stockholders of the effervescent packaging market are expected to gain new opportunities from the growing usage of high barrier material for blister packaging, portfolio expansion, and rising preference of tubes over sachets. Primary-packaging-wise, the report segments the global effervescent packaging market into tubes, blisters, bottles, sachets, and stick packs, and rates tubes are most profitable segment, which accounted for nearly half (49.7%) of the global demand in 2017 and is anticipated to sustain the defining demand throughout the forecast period. Tubes have moisture proof cap, which makes it ideal choice for packaging effervescent tablets. Paperboard cartoons is most in-demand secondary packaging category, by a long way in comparison to side sealed bags and wallet packs. The market for paperboard cartoons is flourishing as they offer better visibility and product differentiation as compared to other forms of secondary packaging. Product-wise, the global effervescent packaging market has been bifurcated into tablets, powder, and granules. Improved palatability and portability of tablets is expected to drive the demand of this segment during the forecast period. On the basis of material type, the market gains maximum demand for plastic, significantly more than aluminum and metal. PE and PP are two prominent sub-segments of plastic as they offer high thermo-stability and compatibility with food products. Pharmaceuticals is the most important end-use segment of the global effervescent packaging market, accounting for more than half of the demand, whereas household products, dietary supplements and nutraceuticals and cosmetics and personal care collectively account for the other half of the global demand. Europe is the leading region in the effervescent packaging market, representing a high incremental opportunity of US$122.9 mn in 2016 as compared to North America, which accounted for slightly less than a quarter of the global demand. Europe has a well-established pharmaceutical market as well is marketed by countries having high healthcare expenditure. Some of the key countries in Europe for effervescent packaging are Germany, France, the U.K., Spain, Italy, Russia, and Poland. Europe is projected for a CAGR of 8.0% during the forecast period of 2017 to 2027. Rising consumer demand in preventive health and increased spending by the government on healthcare are some of the other factors aiding to the prosperity of Europe effervescent packaging market. On the other hand, North America is projected to escalate the demand for effervescent packaging at most robust CAGR among all regions, most of which will be concentrated in the country-wide market of the U.S.
Sanner GmbH, Parekhplast India Ltd., Romaco Pharmatechnik GmbH, Oracle Packaging, Inc., Nutrilo GmbH, Tower Laboratories Ltd., Unither Pharmaceuticals, Amerilab Technologies, Inc., and Hebei XINFUDA Plastic Products Co., Ltd. are some of the key companies currently operating in the global effervescent packaging market. Effervescent packaging is a type of packaging used for packing the effervescent tablets, effervescent tablets are tablets which are high on vitamin content, this tablets in contact with water or beverage breaks up and forms a solution. In effervescent packaging the effervescent tablets are packed in different pack types such as tubes, pouches and foils among others. Most commonly used is the tubes, in which the tablets are enclosed in small tubes with FlipOff closures which can be opened and closed by flip of a thumb. Effervescent packaging is available in different seal diameters depending on the units and size of effervescent tablets to be enclosed. The growth of global effervescent packaging market is driven by the changing life style of the consumers, the consumers more inclined towards beverages with functional ingredients such as vitamin waters, energy drinks and sport beverages. However, these beverages are mostly available in plastic bottles, thus the effervescent tablets with same functional ingredients are gaining more popularity, with less packaging on a per-serving basis of effervescent packaging as compared to the above mentioned products that are sold in plastic bottles and cans. This in turn is driving the market for effervescent packaging market. Furthermore, the advantage of less packaging on per-serving basis of effervescent packaging over the plastic bottles and cans, helps in minimizing the use of plastics and other petroleum based products used for packing the functional beverages, thus having minimal impact on environment. The effervescent packaging’s compact shape and size to accommodate the high vitamin content tablets help the consumers to take it anywhere without having to buy new vitamin drink bottle every time. However, the challenge of tackling the moisture in the packaging might hamper the growth of global effervescent packaging market. Some notable trends in the global effervescent packaging market is the product innovations, for instance, “Sanner” a leading pharmaceutical packaging solution provider has developed effervescent packaging solution with optimal moisture adsorption, protecting the tablets from moisture absorption, irrespective of the climate zones. Above mentioned product innovations will be helpful for countering the restraining factor for effervescent packaging market. 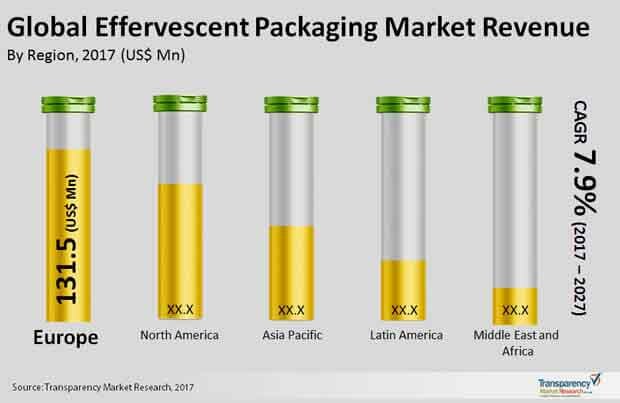 Based on the geographies, global effervescent packaging market is segmented into five key regions -- North America’s effervescent packaging market, Latin America’s effervescent packaging market, Europe’s effervescent packaging market, APAC’s effervescent packaging market, and Middle East & Africa’s effervescent packaging market. Effervescent products being a functional food the effervescent packaging market can be related to the consumption of effervescent products. Among the aforementioned regions, North America accounts for significant value share for effervescent packaging market, owing to the demand for functional food & beverages among the consumers across the country. Europe market for Effervescent packaging is followed by the North America market, which is followed by Asia-pacific and Middle East & Africa market for effervescent packaging. Latin America market for effervescent packaging is anticipated to register a sluggish growth over the forecast period. Overall, the global effervescent packaging market is anticipated to register a healthy growth rate by the end of forecast period, owing to the health awareness and changing lifestyle among the consumers. The effervescent packaging market research report presents a comprehensive assessment of the market and contains thoughtful insights, facts, historical data, and statistically supported and industry-validated market data. The effervescent packaging market report also contains projections using a suitable set of assumptions and methodologies. The effervescent packaging market research report provides analysis and information according to categories such as market segments, geographies, types, technology and applications. The effervescent packaging market report is a compilation of first-hand information, qualitative and quantitative assessment by industry analysts, inputs from industry experts and industry participants across the value chain. The effervescent packaging market report provides in-depth analysis of parent market trends, macro-economic indicators and governing factors along with market attractiveness as per segments. The effervescent packaging market report also maps the qualitative impact of various market factors on market segments and geographies.